Senior year of college is full of ‘lasts’—last first day, last 80’s, last fall break—and for Bates athletes, also a last game. It is inevitable, but that does not mean that after four years they are anywhere near prepared. The athletes at Bates, just by applying, have made a commitment to both their sport and their academics. And while Bates celebrates its students’ academic achievements with senior thesis, final athletic contests often slip by. In order to break down these final senior moments, I spoke with Robbie Montanaro ’19 and Emma Patterson ’19, of men’s soccer and women’s field hockey respectively. Robbie Montanaro ’19 makes a save during a home game against Hamilton on Sept. 8, 2018. Montanaro, the Bobcats’s beloved keeper, fell in love with soccer at an early age. This love stemmed from his Italian father; one could even say that soccer is in his veins. “Some of the earliest memories I have are kicking the ball around with [my dad] in our backyard” Montanaro said. Equipped with both skill and passion for the game, it seemed like a no brainer for Montanaro to continue his sport in college. Montanaro’s soccer career at Bates has been flush with achievements. He maintained a 1.000 save percentage in just over 77 minutes in goal during his first-year season. In his sophomore year, he started all 15 matches of the season with a total of 77 saves and was named to the NESCAC All-Academic selection for the fall semester. During his junior year he started every match again, and recorded the most saves in the NESCAC with 84 saves. 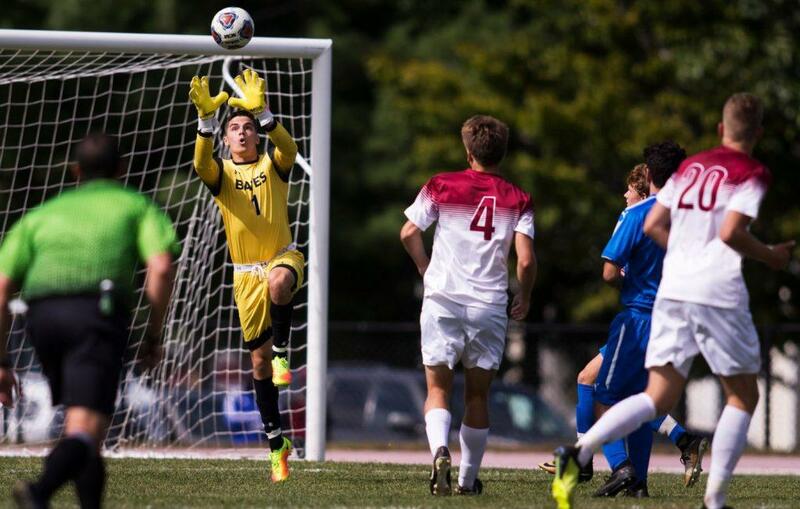 He had four shutouts, including a 1-0 victory over Colby which sent the ‘Cats to the NESCAC tournament. This past year, Montanaro had a goals-against average below one and handed Williams their first loss of the year with a shutout and season high of nine saves. This past Monday, he even played in the New England Intercollegiate Soccer League (NEISL) Senior All-Star Game, which showcased the 44 best seniors from 29 NCAA DIII colleges. However, Montanaro’s career has also had its fair share of disappointments, including his final game played at Bates. Because of the opportunities he has had at Bates and his commitment to the sport even beyond the season, Montanaro is focusing on continuing his soccer career after he graduates. Emma Patterson ’19 makes a pass during a home game against Hamilton held on Set. 8, 2018. Patterson took a slightly different route. She started playing field hockey in the seventh grade, a late start in comparison to many other collegiate athletes. However, she proved to be a natural, competing on many high level teams during her high school career, making state, conference and festival teams, and receiving the Barbara Longstreth Award for sportsmanship in 2013. She played all 16 games during her first three seasons at Bates, missing only one in her senior year. 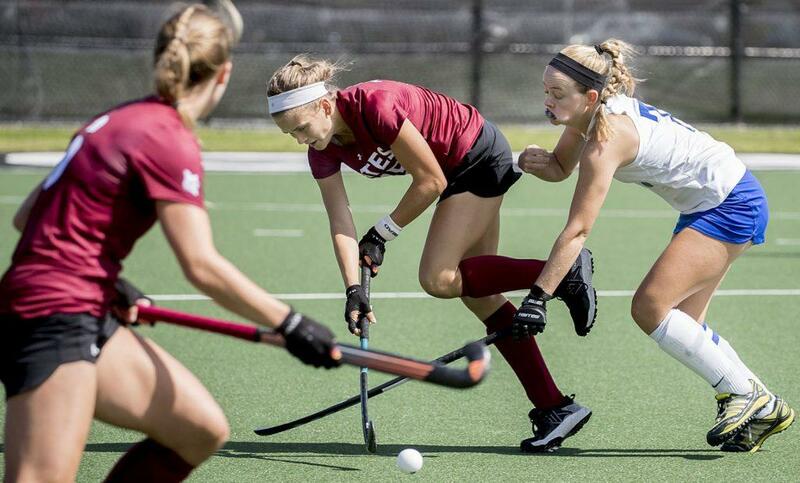 Field hockey was also a priority for Patterson when she was looking at colleges and the primary reason that she applied to schools on the east coast. However, Patterson is equally as fierce in her academics as she is on the field. A psychology major and chemistry minor, Patterson looks to enter medical school within the next couple of years. Unfortunately, her career in field hockey seems to be more uncertain. “Sadly, I am not sure when I will be able to play field hockey again, other than in an adult league” Patterson said. The reasons she will never forget her last game are twofold: “My last game was crazy; it honestly felt surreal. Every single year I have been on the Bates field hockey team it has come down to the Colby game in order to make it into playoffs, so initially it wasn’t any different” she said. However in the first period after an unfortunate chip, Patterson was sent down with a field hockey ball to the temple and an audible whimper. Determined not to miss out on her final game as a Bobcat—and after being cleared by the trainer—Patterson returned to the game. Both athletes, although competing with differing experiences, share one prime thing: doing what they love and representing Bates while they do it. When asked if either player would change anything about their career, both responded with a resounding no. Through all the ups and downs of both Montanaro and Patterson’s careers, they are thankful for every minute they have had. “I am lucky to have been able to be on a sports team for my four years here at Bates and truly think that it shaped my experience!” said Patterson.